Almost every racing website has a columnist or two that ranks the Derby hopefuls leading up to the event. This is our attempt to capitalize on the trend not by saying the ranked horses are the best of the group, but by saying they will somehow defect out of the Kentucky Derby or fall short of expectations. The champion juvenile and winter book favorite for the big race. Pletcher is waiting until March to start this one in the Tampa Bay Derby, the last two year old champ to do that was War Pass. There are other parallels with War Pass and Uncle Mo as well, both completed the Champagne-Juvenile sweep and both seem to have the same career trajectory. War Pass was lightly raced at two with only four starts on his record and Uncle Mo went to post three times last year. More good news for Uncle Mo’s backers too, the last three Breeders’ Cup Juvenile winners did not make it to the Derby. The Remsen to Kentucky path has not been one of success since Thunder Gulch pulled off the trick in 1994. Old Fashioned, Rockport Harbor, and Buddy’s Saint went into their three year old campaigns as hot horses for the Derby only to be sidelined before the main event took place. The runner-up in the Remsen, Mucho Macho Man returned to service in the Holy Bull only to gets his doors blown off by Dialed In as well. At Horse Racing Nation they are advertising Uncle Mo merchandise on the page of Boys At Toscanova, not a lot of respect being doled out for this horse. A Kentucky Derby prep season without Zito is something that doesn’t happen often. His whole stable is centered on having horses entered in the three year old classics and when that doesn’t happen his year is kind of shot. Had fun losing money on Ice Box in the Derby and Belmont last year? Well this is your chance to get more of the same punishment, this horse has the same type of running style as Ice Box and got a win earlier in the season at Gulfstream than Ice Box did. Andrew Beyer also penned that if this horse won the Holy Bull that it would make the prep season much more interesting. Beyer was right on something, that may be a sign of the apocalypse. Not only included here to defeat all claims of having an east coast bias, but also because this is the first three year old in a long time that I think may turn into something special. Twice now he has outrun other stakes horses on final time, on November 27 his maiden victory was faster than the two mile and a sixteenth stakes races that took place and his win last out was faster than a stakes race for four year olds on the same day. So you may be asking me why is he on a list filled with horses that you think may be flops and fizzle out of the picture for the Kentucky Derby? Because the last horse I had this type of notion on was Repent, he got injured after finishing second to War Emblem in the 2002 Illinois Derby and lost subsequent starts in the Travers and Jockey Club Gold Cup. Finally had enough of 7.5K claimers running next to 7.5 foot tall snow berms in 7.5 degrees. 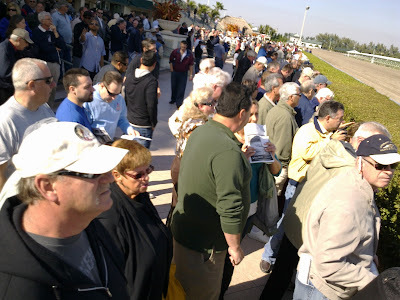 The antidote to cold weather and cheap racing is a trip to 75 degree Gulfstream Park. The weather was much warmer, the horses much classier and there is no snow. However Gulfstream is not a regular track; it is cut from an entirely new cloth. It really is cut from many clothes. 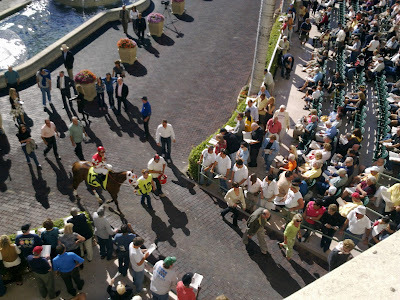 It is like a dozen market research analysts got together and combined the best of Las Vegas, the highlights of sunbelt shopping malls with a modern horse racing venue. What we have is a venue that tries to be all things to all people. Sometimes it works other times it is has a confused identity. This has been mentioned umpteen times in other reviews of Gulstream but I will have to say it again. The grandstand is tiny. Like Gary Coleman tiny. There are only three rows of seats. Other areas of the track are also sized down. It seems the designers studied venues like Belmont "big empty" Park and judged that reduced on-track attendance calls for a new venue. Gulfstream is like a big house with many small rooms. The grandstand is smaller along with the stretch area and the simulcast areas. All of this partitioning makes the place seems crowded and vibrant; even on Friday the rail was shoulder to shoulder when the on-track crowd was small. The walking ring is clearly meant to be the focal point for the entire facility. 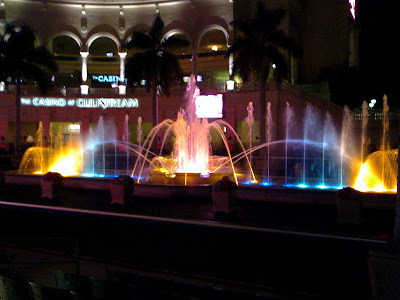 It is a beautiful space surrounding a fountain that was clearly inspired by the Bellagio casino Las Vegas. The walking ring is first thing most people will see when they enter the racetrack area. 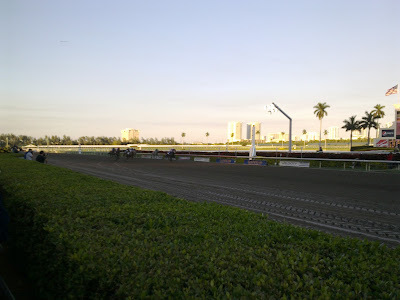 This is not a typical racetrack and Gulfstream throws a curveball here. The saddling paddock is inside the building in a long tunnel away from the crowd. 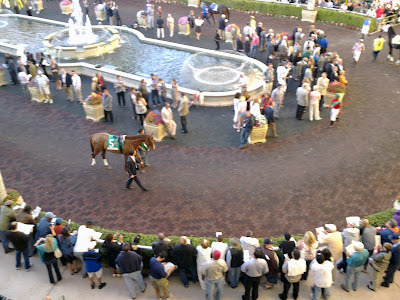 For the first ten minutes of the paddock time the horses are away from the crowd. Someone out there somewhere must hate this but it seemed reasonable. Once the field is saddled they make their appearance to the crowd. 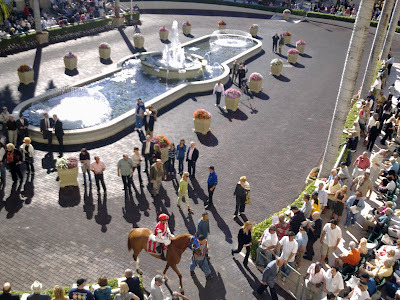 One nice thing about the walking ring is that it is surrounded by a balcony on the second and third floors affording a great view of the horses. However seating is limited. Adjacent to the walking ring is the "Gulfstream Village" mall. Included are upscale typical American mall stores and restaurants. About a third of the stores are still vacant. However I enjoyed dinner at the "Yard House" restaurant on Friday night and it was very crowded even at 11Pm. 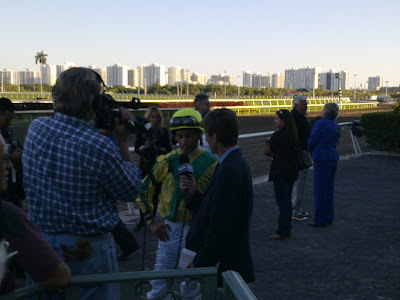 The Mig interviews John Velasquez after winning the Sunshine Millions Filly and Mare Turf. There is still room for improvement on the race track end. The SAM machines are low end AMTOTE machines which are not intuitive like the United Tote machines in New York. The AMTOTE machine lack information like horse names, jockeys and trainers. The worst part is that these AMTOTE machines do not list scratched horses in multi-race wagers. So if you select a scratched horses in the 4th leg of your pick 6 the tote machine simply rejects your wager without any advice on which horses were scratched in which race. To make matters worse many machines were placed in the sun which rendered them completely useless due to glare. Seems like a manager needs to make sweep of this area and correct glare issues and replace the antiquated AMTOTE machines with something modern and user friendly. Most of these machines are used by seniors -even I struggled- they need something simple and intuitive like the machines NYRA uses. Please put together a seating task force and get more seats in this place. 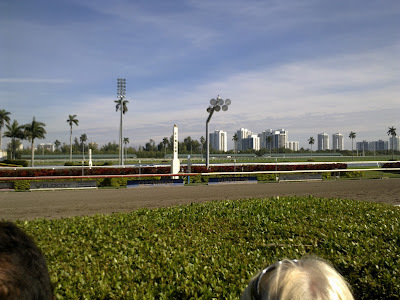 While the views from the walking were great -this is a reason why I took so many picks of the walking ring- there really was not any way for me to watch the races live. The view from the stretch rail was terrible; once again there was nowhere to sit. It seems like most players at Gulfstream opt for one of two Las Vegas racebook style simulcast rooms. 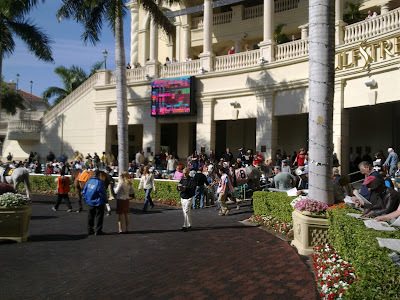 While these simulcast rooms were as nice as any room in Las Vegas -they had hundreds of TVs- the point of going to Gulfstream is to be outside in the sun and not cooped up in a room. 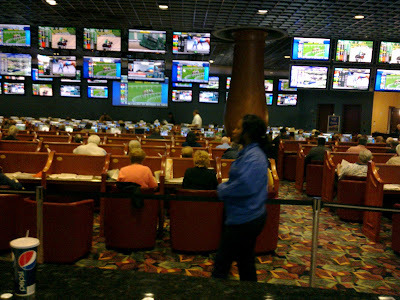 One of two simulcast rooms where every race anywhere in the world is available for wagering. Bellagio inspired fountain in the walking ring comes alive after the races are over with lights and a varied water spray routine. Another shot of the walking ring from the ground floor. 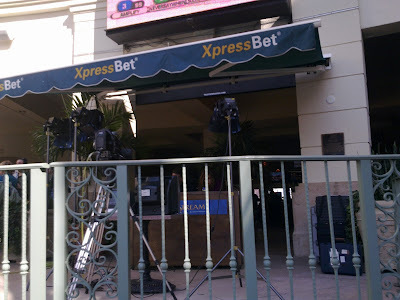 The set where Jessica Pacheco and Ron Niccoletti film the paddock show between races. Perhaps the two best paddock analysts in the game. 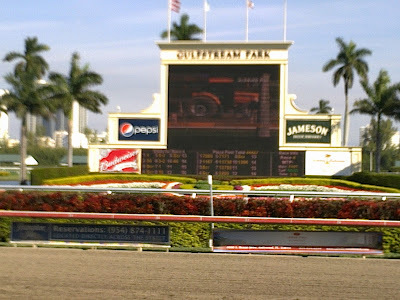 Huge toteboard provides information but blocks the view of the horses on the backstretch. The rail along the homestretch is packed with fans on Friday but once again nowhere to sit. 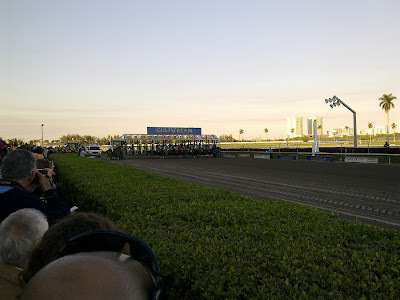 Horses break from the gate in the sunshine millions classic. Horses thunder down the lane during the closing stages of the Sunshine Millions Classic won by 25-1 longshot Tackleberry. It looks like Kent Desormeaux rented a banner plane and had it fly above Gulfstream with this message "Honored to ride- Kent." Is there an innuendo around the track that Kent has too big an ego to care about riding anything less than a graded race? 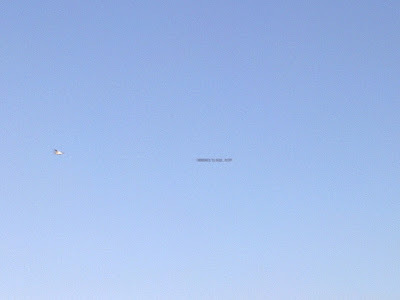 Why would he have to rent an airplane to tell everyone at the track that he is honored to ride? Seems like renting an airplane to tell people you are a humble hard worker is counter-intuitive and an expression of your inflated self worth. 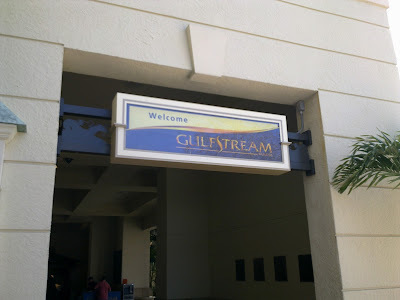 In the end Gulfstream is a venue that tries hard to be many things to many people. 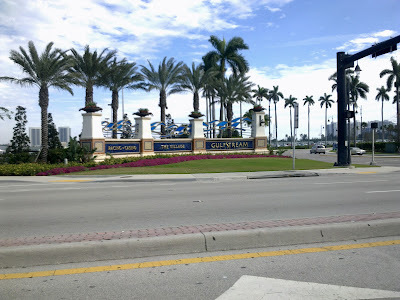 Perhaps too many market research analysts hand their hands in on the recipe and failed to give Gulfstream a clear identity as the venue is more like a hodgepodge of track/mall/casino than village. Still, there are enduring good points. The weather is great, the facility is clean, modern and the food is outstanding; especially for a racetrack. 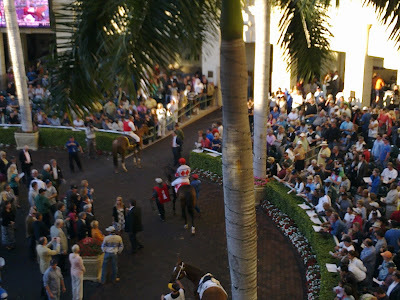 Considering the positives Gulfstream is worth a visit and a fine refuge from the 7.5 foot snow berms and 7.5 claimers. Note: This format has been ripped off and abused more often than any other form of writing out there. Time to pile on to a stale format! These two tracks are far apart on the scales of amenities, aesthetics, and many other forms of judging a racing facility. Not to mention that Saratoga is only open for about forty days out of the year compared to the six months that Aqueduct is open. 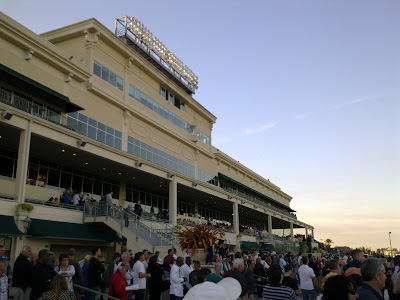 Aqueduct has a less than stellar reputation and Saratoga is put on scale with Wrigley Field and Lambeau Field in terms of “sports cathedrals”. Enough with the hyperbole though, it is time to get down to the brass tax. Advantage: Push, both are great. Although a conversation involving the two is a refresher from the two horses recently discussed for horse of the year. Advantage: Saratoga, anytime you have Jazil as a trump card in a debate it is an automatic loss. Advantage: Saratoga, the Travers seems to produce a close finish almost every year. The winner of the Wood usually blows the field out and the Cigar Mile has that Breeders Cup hangover feel. 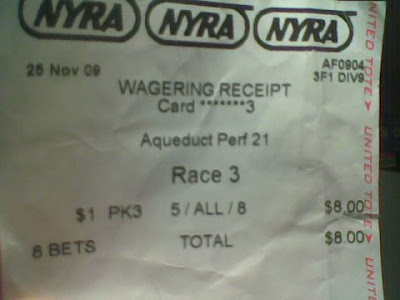 Advantage: Aqueduct; say what you will about patrons who attend the racing at Aqueduct, but they are a dedicated bunch. Aqueduct: Thanksgiving weekend, Gotham stakes day, and Wood Memorial day. Advantage: Saratoga, although with the extended meets over the last few years the racing quality has been watered down a bit. Advantage: Aqueduct, shockingly enough. Above the chop shops there is an old LIRR right of way that connected Rockaway to Queens Boulevard. Advantage: Aqueduct, their crowd is more entertaining. Aqueduct: At the most, hour and a half to two hours by car. Saratoga: Usually two and a half to three hours depending on your location. Advantage: Aqueduct, not to mention that NYC transit also is conveniently near by with bus and subway service. 4-3 Aqueduct, with a big closing kick. Saratoga has its charms, but it wears off fast with peak hotel rates for that area, travel time, and grinding out tough cards throughout the meet. I’m sure I’ll catch flak for posting this, oh well. Live video is now available for tracks other than the Big A, the cogs of progress are moving forward. The next logical step for the wagering platform is to pick up the feeds from the premiere tracks such as Gulfstream and Santa Anita. Here are a few shots from a visit to the Big A on January 17th, all taken from the vantage point of the second floor clubhouse owners boxes section. The demolition/renovation of the nearly 50 year old racetrack is taking shape. The contractor has set up a perimeter fence surrounding the project form the grandstand entrance to the divide between the grandstand and the clubhouse. Negating all shortcut exits that could be made by cutting across the racetrack apron to the grandstand turnstile to make it across the parking lot to the Q37. Steiner Sports was the memorabilia company that picked apart Yankee Stadium during the demolition process. If there was a market for racetrack memorabilia, this place would be Fort Knox right now. More of the carnage, hopefully they update some of the clubhouse side of the plant. The second floor windows still has old signage in clear view. The bank of windows to the left near the owner's box entrance still has GULFSTREAM hanging above its windows. A relic from the days when simulcast wagering had its own bay of windows. When things went wrong in paddock before Saturday's 6th race David Cohen took things into his own hands. Emergency medical technicians and other medical personnel based in two ambulances at the track did not respond in a timely fashion to calls to tend to jockey Junior Alvarado, who was kicked in the groin and lower abdomen by his mount, Starlantic, prior to the running of the sixth race. Alvarado lay writhing in pain in the paddock before jockey David Cohen took it upon himself to carry Alvarado - wrapped in a horse blanket - into the jockeys’ room. 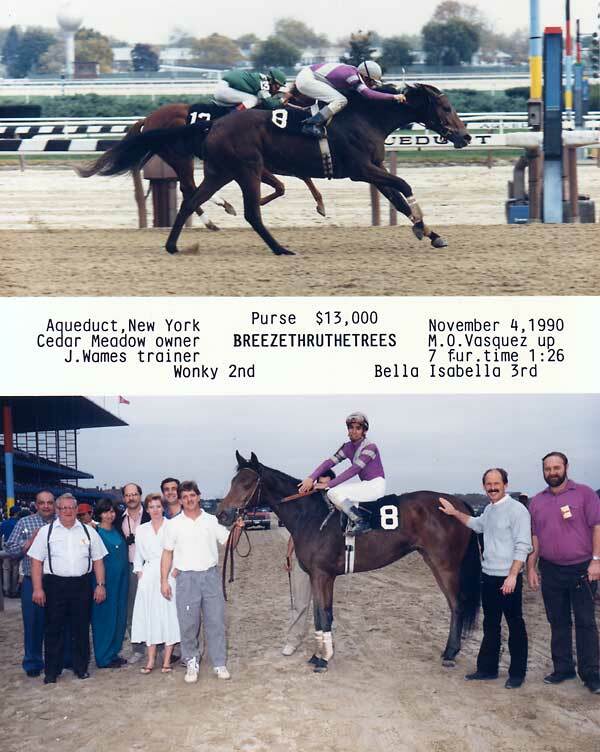 Breezethruthetrees - [88 by Big Spruce out of Chiming Jet] Raced by Cedar Meadow and was stakes placed in the Villager. “On this rock we built our farm.” While we apologize for the mixed biblical reference, we make no apologies for her role as “grand dam of Cedar Meadow.” Not only did she win twice at Aqueduct retiring with earnings of $49,530, she has produced 9 foals of racing age which have won a total of 39 races and earned over $600,000. These include: Secret Breeze [NYRA allowance winner of over $113,000], Chute the Breeze [winner at 3, 4, and 6 at Aqueduct, Belmont, Finger Lakes, Penn National, and Mountaineer of 9 races and over $160,000], Breeze On, a winner at 3, 4, and 5 of over $100,000, Peconic Breeze [allowance winner of $100,000+ and 14 races through 2000], Icicle Charlie [NY allowance winner of over $70,000], Indian Wells Kenny [4 wins at 4 at Aqueduct and Philadelphia], Kipling's Breeze [allowance winner in Texas], and Free As A Breeze. With the racing at Aqueduct it looks like Wind in My Sails will be able to upset this field. This filly is from a family of winners. Not only does she cutback in distance but she is trained over the track.